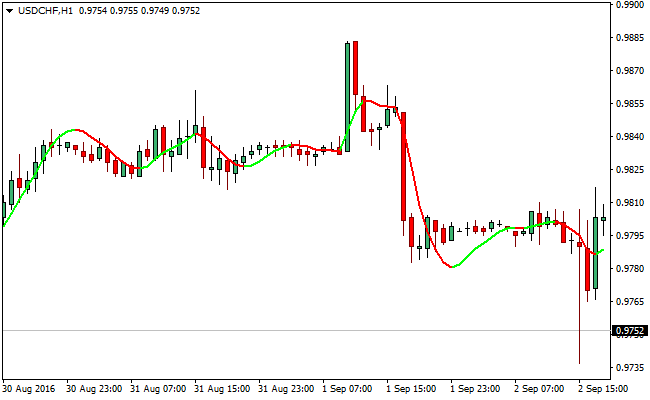 The oT_S_Ra-Signal_Line indicator for MetaTrader4 and was initially created by Allan Hull. The oT_S_Ra-Signal_Line indicator is essentially the Hull Moving Average or the HMA and it is used in spotting current market trend. The curve of the oT_S_Ra-Signal_Line indicator is significantly smoother. The oT_S_Ra-Signal_Line is built to follow the price activity much closer. Traders use this indicator for long- and medium- term trading. Usually, when more days are added to moving averages they tend to get more lag, and the oT_S_Ra-Signal_Line indicator was able to resolve this by adding more weight to the moving average. The oT_S_Ra-Signal_Line indicator can be deplored just like the Aroon and ADX indicator, in a manner that allows it spot dominant trend. When the curve of the oT_S_Ra-Signal_Line is surging, the dominant trend is surging as well, while when the curve of the oT_S_Ra-Signal_Line is dipping, the dominant trend is also dropping as well. There’s also a color notification that alerts traders to buy when the line changes to line and sell when the line changes to red. The man behind this indicator advises the oT_S_Ra-Signal_Line crossings should be avoided. The ability for the oT_S_Ra-Signal_Line indicator to overshoot current prices can also be perceived as a weakness, something traders needs to be wary of. In respect to its timely nature, the oT_S_Ra-Signal_Line indicator is very resources when spotting turning points designated for entries and exit. Customization options: Variable (period, method, price), Colors, width & Style.